When the Green Pajamas first started playing together, a gallon of gas cost 91 cents, a pack of cigarettes cost 82 cents, Ronald Reagan was in the middle of fighting the Second Cold War, the USA Today began publishing and Michael Jackson’s Thriller was the number-one album in the world. 36 years later, the Jeff Kelly-led cult band with more than 30 well-worth-seeking-out albums under its belt is playing its last show ever. 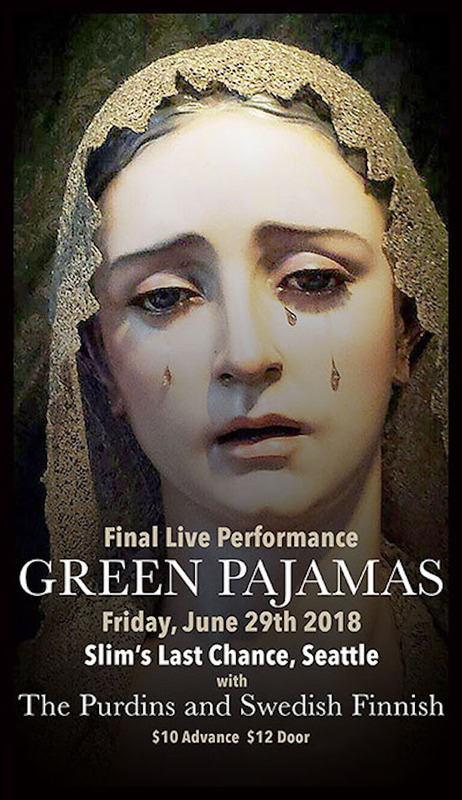 This Friday, at Slim’s Last Chance in the band’s native Seattle, the Pajamas will take the stage for the final time with the promise of giving their devoted fans something special to remember them by. Kelly and Co. say they’re leaving the door open for the possibility of new music being released under the Green Pajamas moniker, and he and his bandmates will continue on with their solo and group projects. Yet June 29, 2018, will remain a sad day for the small-but-loyal number of us who were lucky enough to have had the Pajamas and their music in our lives for so long. Even though it’s time for bed, you can bet we’re gonna stay up extra late, ordering cognacs from Kim The Waitress, eating peppermint sticks, wearing our favorite Green Pajamas one last time and knowing this is where they disappear.